4-piece set includes plastic 3-section plate, 5.25-inch rimmed plastic bowl, plus stainless steel spoon and fork with plastic handles. Main section of the plate is 6.25 inches in diameter. Ear sections are 3 inches wide. All pieces are dishwasher safe (top rack). Plate and bowl are microwave safe (flatware is not). BPA, PVC, and phthalate free. 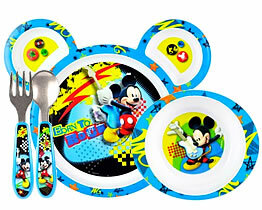 Great for little fans of Mickey Mouse.